While multiple diamonds make gorgeous engagement ring s, there is still nothing quite like the simple grace of a diamond solitaire. 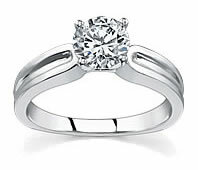 The inexpert eye may distinguish this engagement ring as plain. However, after a couple of visits to the jewelry counter, you will fall in love with this timeless look. 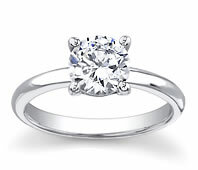 Of course, diamond solitaire engagement rings usually come with larger diamonds, which can make them a more costly choice. Still, anyone can buy an exquisite diamond solitaire for their brides-to-be. If you are on a tighter budget than most, you can focus you attention to other details that will bring out the character and beauty of any diamond, even a minor one. Diamond solitaire engagement rings look great in any size. While round brilliant diamonds make glowing engagement rings, choosing a more sole shape will offer a lovely distraction from the size of the diamond. For romance, steal her heart with a unique heart cut diamond wedding ring. 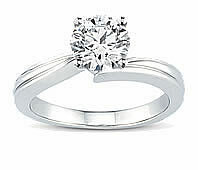 For the diva, daze her with a marquise diamond engagement ring. Is the woman you love a fan of high fashion? Astonish her with a stylish emerald cut diamond solitaire. 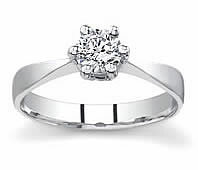 Of course, if the engagement ring is a surprise, look to her current jewelry collection for an idea. Does she have a pair of square diamond or gemstone earrings? If so, surprise her with a princess cut engagement ring and make her your queen for life.